Before Europeans arrived in Oklahoma, Native American tribes lived throughout the land. These tribes included the Ute, Comanche, Osage, Quapaw, Wichita, and the Caddo. The Caddo and the Wichita lived in the southern part of the state and had similar customs and history. The Quapaw and the Osage lived in the eastern part of the state and spoke a similar language. They grew corn and hunted buffalo. 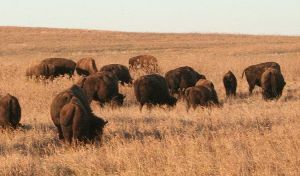 The Comanche and the Ute were pure hunters who lived mostly off of buffalo. They followed the buffalo herds and lived in portable homes called teepees. The first European to arrive in Oklahoma was Spanish explorer Francisco Vasquez de Coronado in 1541. Like most Spanish explorers he was searching for gold, but did not find any in Oklahoma. Over one hundred years later, French explorer Robert de La Salle arrived. He claimed the land for the French who then established fur trading posts along the rivers in the region. In 1803, the United States bought a large region of land west of the Mississippi River from the French for $15 million. It was called the Louisiana Purchase and included Oklahoma. Explorers such as Zebulon Pike and Captain Richard Sparks were sent out by President Thomas Jefferson to map out the new territory. In 1819, Oklahoma became part of the Arkansas Territory. In 1830, Congress passed the Indian Removal Act requiring the Indian tribes in the Southeast to give up their land and move to the west. Oklahoma was set aside as Indian Territory. Many tribes moved to the new territory including the Creek, Chickasaw, Seminole, Choctaw, and Cherokee. Some tribes were forced to march to the new territory under harsh conditions. When the Cherokee were forced to march from the Southeast to Oklahoma in 1838, around 4,000 Cherokee died along the way. Today, this march is called the Trail of Tears. 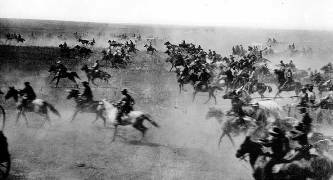 After the Civil War, Oklahoma became part of the American frontier. Cattle ranchers used Indian lands to graze their cattle. It was a land of cowboys and Indians. In the late 1800s large sections of Oklahoma were unoccupied. Despite making promises to the Indian tribes that the land was theirs, the United States decided to allow settlers into the land. In 1889, a large section of 2 million acres was opened to the public. Homesteaders had to wait on the border and then "rush" in to grab their land when a gun was shot. Some people cheated and snuck in early. These people were called "sooners" and gave the state its nickname. In 1890, Oklahoma was split into the Oklahoma Territory and Indian Territory. The leaders of the Indians wanted to make their own state called Sequoyah. They applied for statehood in 1905. However, Congress rejected their application and instead reunited Oklahoma into a single state. Oklahoma became the 46th state on November 6, 1907. The original capital city was Guthrie. The capital was moved to Oklahoma City in 1910. 1541 - Spanish explorer Francisco Vasquez de Coronado is the first European to arrive. 1682 - Robert de La Salle claims Oklahoma for France. 1803 - Oklahoma becomes part of the United States through the Louisiana Purchase. 1819 - Oklahoma is part of the Arkansas Territory. 1830 - Congress passes the Indian Removal Act. 1835 to 1838 - Many Indian tribes are forced to move from the southeast to Oklahoma. 1866 - Slavery is abolished. 1889 - Much of Oklahoma is opened up to homesteaders. 1897 - The first oil well is drilled in Oklahoma. 1905 - The Indian tribes request to create an all Indian state called Sequoyah. 1907 - Oklahoma becomes the 46th state. 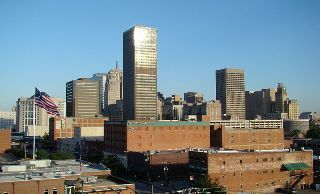 1910 - The capital city is moved from Guthrie to Oklahoma City. 1930 - Severe drought begins across much of the Great Plains causing the Dust Bowl. Many people will leave Oklahoma and head west in the years to come. 1995 - The Oklahoma City bombing occurs when terrorists bombed a government building killing 168 people.